When you begin the patent application process, you will run into a lot of unfamiliar jargon. If you do not understand the definitions of these terms, you may end up confused or making simple avoidable mistakes. 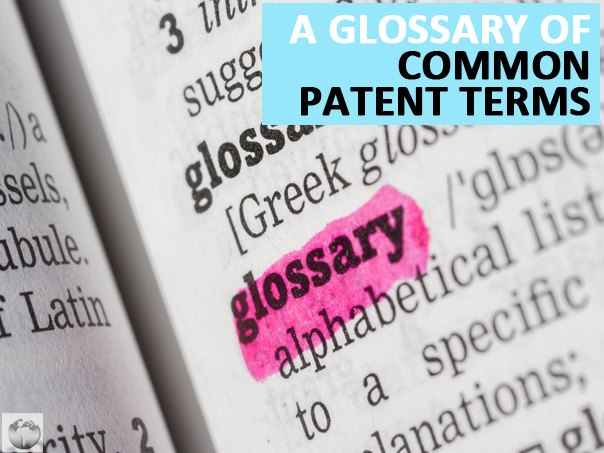 Here is a handy glossary of the most common patent terms you will run into that you can reference at any stage of your patent process. the applicant. If you abandon your patent, you will receive a "Notification of Abandonment". Allowance: The claims the USPTO believe to be patentable on a patent application. Once an examination is complete, you will receive a �Notice of Allowance and Issue Fee Due� meaning you will receive a patent once you pay the patent issuance fee. Application Data Sheet (ADS): A form that is filed with the USPTO that contains the inventor�s name, title, assignee information for application publication, and correspondence address. Apparatus Claim: A patent claim that describes the invention. Assignee: A person that has obtained the rights to pursue a patent. Assignees usually buy the rights to a patent from the inventor. Certificate Of Correction: A certificate issued by the USPTO that indicates errors in the patent as issued. Confirmation Number: A four-digit number issued by the USPTO when the patent application is filed that ensures all the corresponding documents are filed together. Contributory Infringement: The use, manufacture, or sale of a patented product that infringes on a method claim. Declaration: A document signed by the inventor and submitted to the USPTO that declares that they are the inventor of a product. Design Patent: A type of patent that covers the ornamental design of a product. Doctrine Of Equivalents: The rule that an element in a claim must also include equivalent structures, if they do the same thing to accomplish the same results. Examination: The review of a patent application by a patent officer. The examination includes making sure the patent meets USPTO requirements and that no other comparable invention exists. Filing Date: The date on which the patent was filed. Final Office Action: A second patent rejection from the examiner, known as the final ruling. First To Invent: If two patents are filed for the same device, the USPTO grants the patent rights to the first person to file, known as the first to invent. Grace Period: A time period in which to complete a patent application task. Information Disclosure Statement: A form filed with the USPTO that satisfies the legal requirement to inform the Examiner of all prior known inventions that are relevant to the patentability of the invention. Infringe: When a non authorized person or entity makes, uses, or sells a patented device without the inventor�s permission. Inventor: A person who contributed to the initial design of a product. Large Entity: A company with 500 or more persons. License: A document that grants the rights to use, make, or sell an invention to a third party. Maintenance Fees: Fees to be paid to the US Patent and Trademark Office at 3.5 years, 7.5 years and 11.5 years from the date of issue of a patent. Means Plus Function: A claim by describing what an invention does, rather than what it is. Method Claim: A claim that covers a way of doing something, usually described in steps. Nonobvious: Nonobvious is one of the invention requirements to get a patent. If an invention is nonobvious, it means that anyone without knowledge in the field could not have easy come up with the idea. Novel: Novel is one of the invention requirements to get a patent: If an invention is novel, it means it is new and there are no other inventions like it in the patent records. Oath: A declaration swore in front of a notary or court official. Objection: Objections are a type of patent rejections that deal with errors in the patent application such a misspellings, missing paperwork, or incorrect data. Office Action: An explanation of why a patent has been rejected by the examiner. Plant Patent: A type of patent that covers asexually reproduced plants. Prior Art: Patents that existed before a current invention was examined. Rejection: An office action issued by an examiner based on the patentability of the device. A rejection is a patent denial that is based on the existence of prior art. Specification: The text part of a patent that specifies the details of the patent. Useful: Useful is one of the invention requirements to get a patent. If an invention is useful it means that it has a function or utility. Utility Patent: A type of patent that covers inventions. These are just some of the basic terms you will run into when applying for a patent. If you need help understanding the patent language you should contact our helpful professionals Own My Invention. We know all the terminology you will encounter during the patent application process and we can help you understand how those terms apply to your patent. So check out our services today and keep this list handy for when you are going through the patent application process.